BRATTON on UCSC growth, the chancellor, the state…GREENSITE on saving the Washington St. tree…KROHN about San Diego’s California Democrats convention, rent control history, UCSC’s growth issue…STEINBRUNER and water tax, Friend and Coonerty and sb623 and politics, property tax relief, the library fund…PATTON and runaway growth…EAGAN and Mueller’s Fairy Tale…DeCINZO about parking meters…JENSEN handles the Oscars…BRATTON critiques Annihilation, Happy End, GameNight UNIVERSAL GRAPEVINE GUESTS…QUOTES for MARCH. LINCOLN AND CENTER STREETS. The Cope Row homes shown here on the right were built in 1894. RAQUEL WELCH AND CHER. No comments necessary except to newer generations. UCSC, CHANCELLOR BLUMENTHAL, DONNA MEKIS AND THE GROWTH ISSUE. 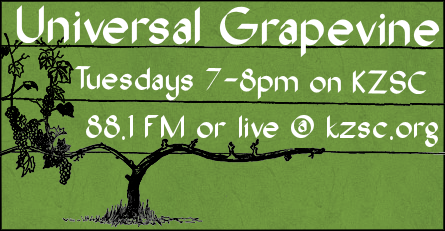 Having known Donna for decades, I interviewed her on my Universal Grapevine radio program Tuesday, February 20 from 7-7:30. (here’s a link to the radio interview ). First of all, it isn’t the chancellor who decides the size of enrollment, or who makes most of the decisions that have been driving us all so crazy — it’s the Board of Regents: Board President Janet Napolitano and of course Bill Monning and Mark Stone. UC Merced is planned to have 25,000 students by 2050 and it’s also figured to have 10,000 by 2020. They don’t have empty beds or buildings there either. Constructing new buildings at any campus costs big bucks and the State has cut back tremendously on funding UC. We should realize too that there are 19,500 UCSC alumni living here in Santa Cruz — and that UCSC is the largest employer in the county, and has an economic impact of $1.3 billion dollars. We definitely need new thinking — and new directions — on this. THIS TREE NEEDS YOU IN ITS CORNER. In the battle between trees and PG&E, round one went to the trees. Or, more accurately, one tree. At the hearing to decide the fate of the city’s public trees in the coastal zone (a tiny sample of trees that PG&E wants to cut down) the Zoning Administrator, Eric Marlatt, directed PG&E to return with an assessment of the feasibility of re-routing the gas pipeline to save the tree. I’m not accustomed to staff siding with a tree so my smile and good feeling lasted all day. The tree in question is the one pictured and it lives on Washington Street. Its lean is more of a camera angle than actual. It’s a battler since it’s surrounded by asphalt and concrete. We give it the name Corymbia or more commonly, a Red Flowering Gum. Yes, it’s non-native but the birds and the bees don’t care so neither should you. It’s a beauty and one of the last of few to survive the full scale slaughter of these trees which lined Front St. until the 1990’s when the then Parks Director ordered them all cut down. At the time I asked him why and the answer was “they are not our idea of a street tree.” The straggly bunch of sad looking tree replacements currently on Front St. underscores the loss. An older survivor of the same species is battling for its life on Cedar St. next to the newly dug hole in the ground, which will eventually be transformed into high rent, high rise apartments. The city arborist and the consulting arborist are optimistic for its survival despite the excavation for the foundation abutting its trunk and the severe pruning required to accommodate the development. It was without doubt one of the signature downtown trees. Its uncertain future makes the effort to save the same species on Washington St. even more urgent. PG&E were not exactly pleased at the Zoning Administrator’s decision. They demurred about putting additional bends in underground gas transmission lines (which the ZA pointed out would not be necessary) and worried about other underground infrastructure making a re-route difficult. And the old bottom line of cost was raised since they are, they say, concerned about costs to their customers. Re-routing a small section of pipeline is chump change compared to the $1.6 billion in fines to PG&E following their negligence and cover-ups associated with the San Bruno fires. They politely agreed to do the assessment and asked for an early hearing. That hearing will be on March 7th at 10am in council chambers. I hate to do it but I am going out on a limb and am begging you to send an email to the Zoning Administrator: emarlatt@cityofsantacruz.com, prior to the hearing. 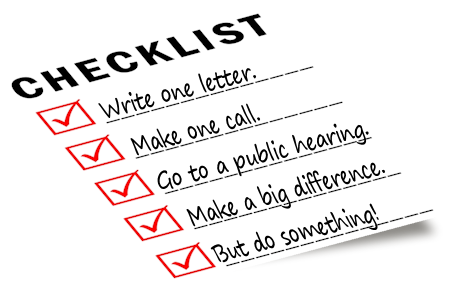 Don’t feel guilt-tripped: feel confident that your 5 minutes of effort will make a difference. Few issues are as focused and simple as this one. Even more rare is to have staff in support. I suggest a simple statement that you are writing in support of saving the heritage tree on Washington Street; that you encourage PG&E to cooperate to the fullest with the city’s aim to save the tree; that you request an independent evaluation of PG&E’s assessment of the feasibility of re-routing the gas pipeline. I believe the last request is the most important. Despite their slick Public Relations, PG&E have not been honest or forthcoming in their promotion of this massive tree- cutting project. Convincing research and evidence makes the project itself questionable. We still have no idea how many big trees on private property within the city they are requiring to be cut down. Is it in the hundreds? We don’t know and they won’t reveal that figure. So independent scrutiny of their findings in this case is crucial. I hear some whining: “all this fuss over one tree; what about world hunger?” A motorist actually yelled that at us when we held our weekly tree vigils to try to save the iconic red-horse chestnut that was felled for the Hyatt on Broadway. On some fundamental level, both are connected. 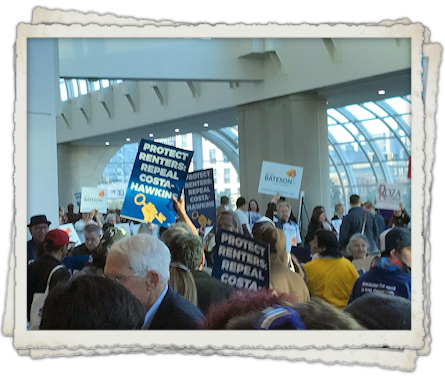 On the floor of the sprawling San Diego Convention Center, California Democrats were on an historic, change-making mission. They frankly seek the national leadership mantle in ousting Donald J. Trump and all he stands for, and remove him from the golden cash Brahmin bull he now sits atop. You might remember, ‘the top’ used to be called our federal government. It’s readily apparent from this San Diego gathering that CA Dems are in it for the long-term fight, and perhaps find themselves at the center of a kind of coastal exterior vs. flyover interior post-post-modern-day power struggle. Although Dems did not reach consensus on a Governor, Lt. Governor, U.S. Senate, or Attorney General endorsements, what they did seem to agree upon is that it is their election to lose. Democrats carry overwhelming voter registration numbers in California, occupy every statewide office, and have an easy foil in roundly reviled President Tweet, as they head for the June primaries. The biggest upset vote was Kevin De León besting Sen. Diane Feinstein. He won 54% of the 2,775 delegate votes cast. Former State Schools Superintendent Delaine Easton surprised many by capturing third place in the race for governor, beating a likely favorite, Los Angeles Mayor Antonio Villaraigosa. In first place was Lt. Governor Gavin Newsome with 39%, followed by State Treasurer John Chiang’s 30%. None of the gubernatorial candidates were even near the 60% threshold needed to capture the party’s endorsement. It’s always a raucous display of candidate partisans yelling, sign-waving, and sometimes dancing, in the hallways surrounding the cavernous main hall. They support a multitude of assembly, senate, board of equalization, governor, lieutenant governor, and U.S. senate and house candidates. Sometimes you might wonder if the convention is being held in South Bend or Columbus on football homecoming weekend. It’s always hard for me to believe that delegates could be swayed by such displays of mirth and mayhem, but it happens at every state and national convention. It’s probably to show a legitimate level of support for a given candidate, and if that’s true, repealing Costa-Hawkins and the labor movement seemed to make the most noise. In fact, the roar reached a crescendo outside of rooms 30a and 30b on the convention’s second floor. That’s where the Democrats picked up their ballots, and the long snaking line of delegates became a captive audience. In fact, there were two San Diego police officers, both mentored by our own Santa Cruz Chief of Police Andy Mills, working to keep the halls clear so delegates could pick up their ballots and vote. Small world. The Rents, the Rents Are Too Damn High! 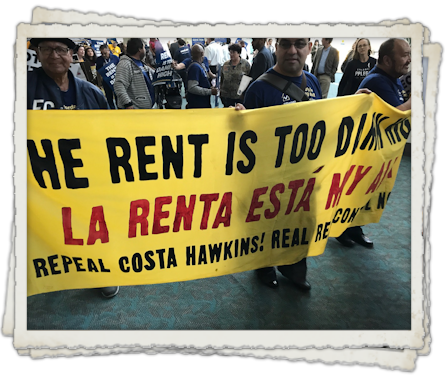 A large contingent showed up to endorse the repeal of the “Costa-Hawkins Rental Housing Act.” Costa-Hawkins, passed by the legislature and signed into law by then-Governor Pete Wilson, went into effect in 1996 and effectively gutted rent control in the state of California. This act undermined rent control by allowing for “vacancy decontrol.” That is, when a tenant moves out, instead of the next one paying the previously “controlled rent,” the act granted the landlord the ability to set rents at whatever the market will bear. It was previously up to each city to decide upon rent control. What Costa-Hawkins did was severely limit the individual powers of cities. Signatures are now being gathered statewide to repeal Costa-Hawkins. If it is repealed, it will give the Santa Cruz rent control initiative infinitely more teeth, and renters a more comfortable seat at the housing table locally. Will 2018 and 2020 be the most progressive elections in Santa Cruz, state, and U.S. history? 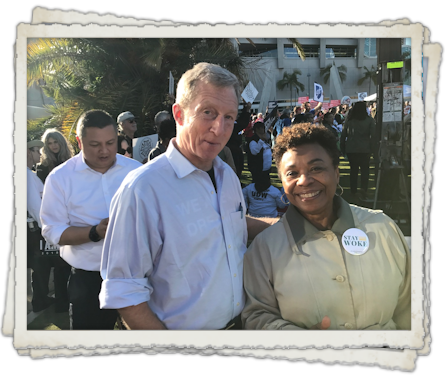 The party stalwarts who came to San Diego were angry and aggrieved, but also joyous and organized looking to pick up congressional and senate seats nationally. 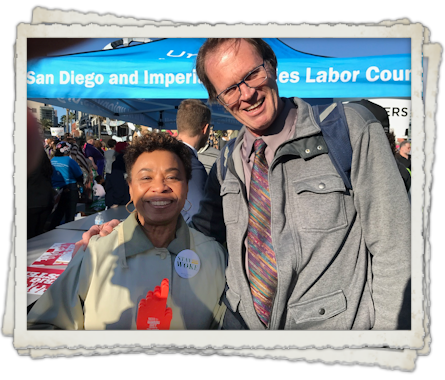 Democrats in San Diego, 2,857 of them showed up to vote, are ready for a fight and confident, but also seemingly ready to do the trench work of walking neighborhoods, raising money, and reaching out to voters. On another hand, because Trump is such an easy target, CA Dems have essentially papered over some of their differences. As the Bernie-crats stay left, the party elders move ever so slightly rightward, each side desperately hoping to show Trump to the exit ramp. 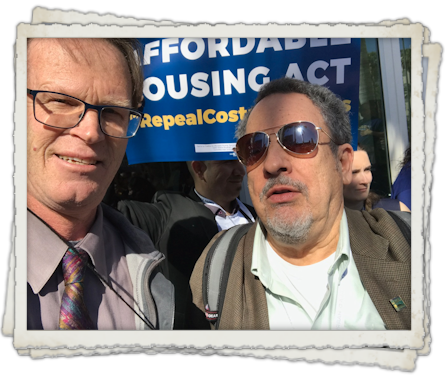 Statewide, Democratic Party internal battles still abound and they include: single-payer healthcare; a state bank; homeless assistance for cities; repealing Costa Hawkins; and state regulation vs. local control of issues surrounding landuse and housing development. And of course, there is righteous support for electing a new U.S. 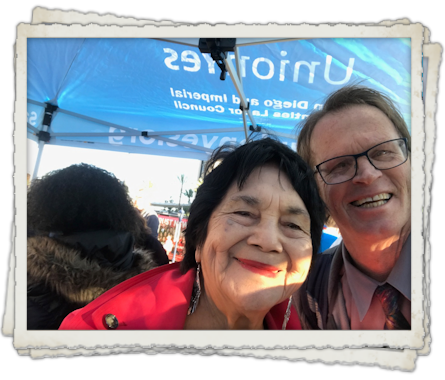 Senator to join Kamala Harris in Washington, D.C.
Dolores Huerta. Always a pleasure to be around her. 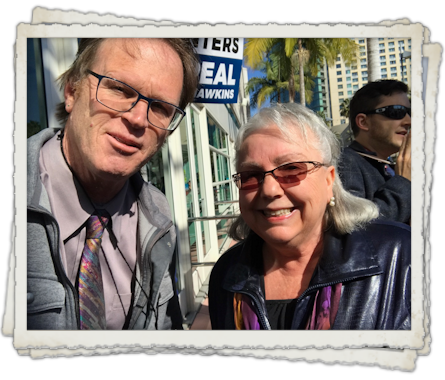 She signed the Save Beach Flats Community Garden petition and I signed her repeal Prop. 13 for business properties petition. 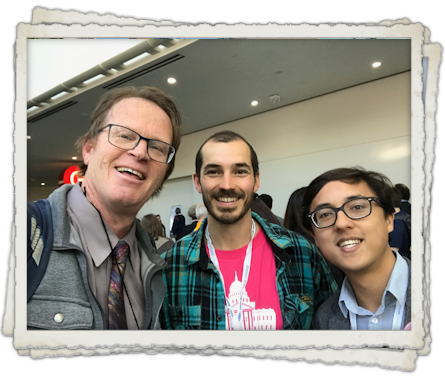 With Santa Cruz organizers Erik Erikson and Jeff Stoll. WHY WOULD SANTA CRUZ COUNTY BOARD OF SUPERVISORS SUPPORT TAXING YOU FOR WATER AND ALLOWING POLLUTERS TO CONTINUE CONTAMINATING DRINKING WATER SUPPLIES? Santa Cruz County Board Chairman Zach Friend and Supervisor Ryan Coonerty recommend supporting SB 623 to impose, beginning on July 1, 2020, a $.95 monthly water tax on each and every household, impose a tax on all fertilizer sales and distribution, and a tax on all dairy products. The bill would put the burden on local agencies to collect the anticipated $140 million annual revenue, turning it over to the State Water Board to decide how to help out disadvantaged communities with groundwater contamination. In exchange for paying this new tax to the State, the POLLUTERS WOULD BE EXEMPT FROM ANY ENFORCEMENT OF REGULATION REGARDING GROUNDWATER CONTAMINATION until 2035. SB 623 was introduced by State Senator Bill Monning last year. 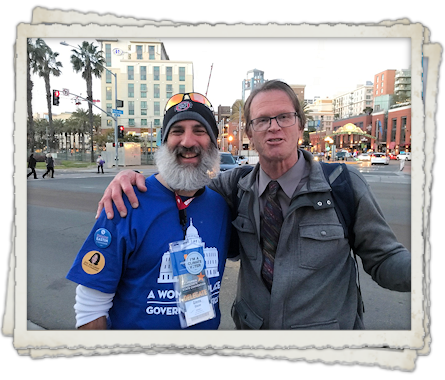 Now it’s back, with additional endorsement by Senate Pro Tempore and candidate for Governor Kevin DeLeon (Los Angeles) and Senator Bob Hertzberg (San Fernando). While the water tax is currently proposed to be $.95 per month per household, the rate can be increased in the future if the State Board determines that the funding need is greater to assist communities with problematic water supplies. Water is a basic requirement for life…should it be taxed even more than what it costs to produce it (Prop. 218 stipulates water sellers cannot charge more than the cost of supplying the water). Anyone who declares themselves impoverished (below 200% of the federal poverty limit which would be roughly $98,000/year for an individual) is exempt, but must file with their local water agency for exemption. Will all of the poor apply for exemption? Public water agencies would be mandated to collect and administer the tax monies to the State but on page 19 of the SB623 text, Section 6 says the State is not required to reimburse local agencies unless the Commission on State Mandates determines it necessary. SB 623 would ignore the California Constitutional mandate that local government be reimbursed for collecting and administering state mandates. SB 623 states the money collected with all these new taxes must only be used for projects addressing problematic groundwater supplies, but COULD be transferred to other uses with a 2/3 vote of the legislature (section 116771 (f) on page 13 of the text). Do you trust your legislators not to dip into this fund for other “public benefit projects”? SB 623 would allow community water systems to apply for exemption from collection of the per-household water tax, based on the finding that the amount that would be required to be remitted to the Board to be minimal, but the water company cannot appeal if the State denies their application. (116771 (d) on page 13. Under 116772 (a) a public water system can apply to use an alternate assessment method for charges imposed by SB 623, but that alternate method, if approved, could only be used for five years maximum. SB 623 would require County Environmental Health Agencies to submit a list of all small water systems to the State Board by January 1, 2019. Again, this is requiring local government to spend time on meeting the State requirements but not getting reimbursed Santa Cruz County Environmental Health Agency staff does not have a comprehensive list of all small water companies but is working to collect that information for another State mandated program, the Sustainable Groundwater Management Plan, required to be submitted and approved by the State by January 1, 2020. SB 623 would mandate all fertilizer manufacturers, handlers, transporters and sellers to allow State Board access to any and all accounting practices, facilities and related information. It would also mandate all dairies allow State Board access to any and all buildings and facilities as well as accounting practices and information. NONE of this information however, including the audits of Safe Drinking Water Fees by the polluters, would be public information. (section 116772 (d) and (e)). Do you trust that big corporations that may be contaminating groundwater would be held accountable for money paid in order to continue polluting? Under SB 623, members of the public would not be able to file a Public Records Act request to find out. How much of this new tax money would actually get spent on improving problematic groundwater drinking supplies? SB 623 allows the State Board to spend 25% of the fee money on administration. How will the State determine who gets the money? SB 623 requires reports of problems by all water agencies to be submitted for consideration. The money can be spent for “settlements from parties responsible for contamination of drinking water supplies” (Section 116768(1c), and in Section 116768 (2) states:” funds shall be prioritized for CONSOLIDATIONS”. SB 623 removes mutually-owned water companies from the list of eligible applicants for project money. 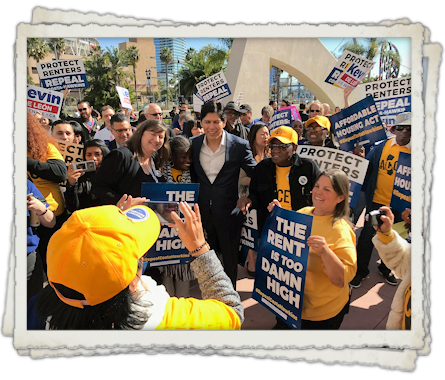 I wonder if the recent Democratic Party endorsement of Senator Kevin DeLeon for Governor has anything to do with Zach Friend and Ryan Coonerty’s endorsement of SB 623 and their lust for climbing the political ladder? Contact Senator Bill Monning and ask why he wants to support groundwater pollution: 831-425-0401 Santa Cruz Office in Suite 318A at the County Government Building (701 Ocean Street, Santa Cruz), or contact his analyst in Sacramento (recommended on his website) Mary Dolan 916-651-4017. I really have to wonder what in the world Senator Monning is thinking??? The Board of Supervisors will hear County Administrative Officer (CAO) Carlos Palacios hand out bad news about the projected budgetary shortfalls predicted for the near future during the Tuesday, February 27 Board meeting, Items # 49 and #50. Mr. Palacios predicts a $7-$10 Million shortfall by 2019-2020, but maybe as much as $12-$15 Million. This is due mostly to the looming retirement costs of an aging County employee crowd getting ready to retire. Currently, for every 1 retired employee, there are 6 employees working. However, in five years, the ratio will be 1:1. Retirement costs are now at $43 Million for the current fiscal year but by 2024-2025, the County’s retirement burden will be $76 Million annually. CAO Palacios states in 2018-2019 Budget, “There will be no General Funds available for Capital Improvements or for major infrastructure repairs.” Wow. 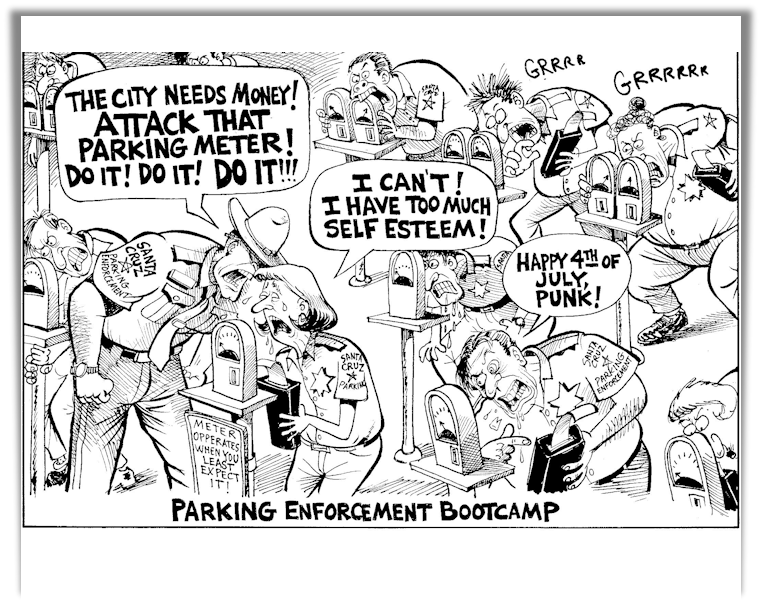 Increase the Parks and Recreation tax currently collected on County Property taxes as CSA 11. Mr. Palacios recommends a .5% increase. He also refers to “belt-tightening” by all County Departments and examining how fees can be increased for certain services. Uh-oh. Notice that there is no recommendation to reduce salary levels of middle management. By the end of the week, the video recording is available on the calendar date of the meeting. It’s really great that the public has this option…not many can attend the Tuesday 9am meetings in Santa Cruz to hear the bad news in person and be able to comment. The Supervisors are consistently unwilling to hold meetings during evening hours to accommodate the working population. #15 Property Tax Penalty Relief. County Policies and Procedures Manual Section VII part 1000 states that “A taxpayer can request waiver of interest and/or penalties, costs, and fees (IPCF) that are attached to their taxes due to being delinquent and /or defaulted.” This is set forth in the California Taxation and Revenue Code. Under Section 4985.2, the County Auditor/Controller can allow this waiver “provided principal payment for the proper amount of the tax due is made no later than June 30 of the Fourth fiscal year following the fiscal year in which the tax became delinquent.” No actual tax money is waived. In 2017,there were 325 such requestsof which 203 were granted, totaling $130,315.57 waived. #17 The County Library Fund anticipates a $4.5 Million EXCESS IN REVENUE. Staff is asking for a bit more time to complete that report. The Board of Supervisors allocates any excess property taxes in the County Library Fund for exclusive use on improvements or services at County Library Fund branches. I wonder why we did not see this in the Measure S Campaigns before we voted in that new sales tax? #19 Supervisor John Leopold recommends the Board support AB 2308 to ban cellulose acetate cigarette filters in the County. The marine life will be grateful for that action. #22 Supervisor Ryan Coonerty recommends the Board support Prop. 68 which we will see on the June 2018 ballot. This is SB 5 that raises $4 Billion in bond money (more debt) for the “California Drought, Water, Parks, Climate Change, Coastal Protection Outdoor Access for All Act of 2018”. I wonder how that will all get administered? 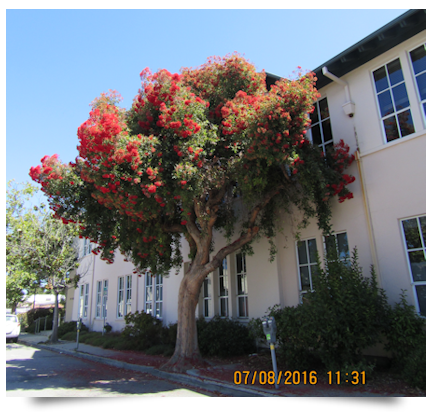 #26 Report by the County Historic Resources Commission., submitted by Supervisor Zach Friend. Did you know the State Historic Preservation Office staff has termed Santa Cruz County as “the Black Hole of Historic Preservation”? The Historic Resources Commission acts regularly to demolish historic structures, such as the oldest house in the Hihn Subdivision in Aptos Village (8057 Valencia). The Planning Dept. advertised it publicly as a “partial demolition”…not one splinter of virgin redwood remained standing after the Randazzo demolition crew finished loading it all into a dumpster headed for the landfill. #27 Award an additional $63,044 to buy a replacement airplane engine for the County Sheriff’s Air Patrol. This plane was purchased in 2014 with a Homeland Security Grant that allocated $53,886 for the plane to support surveillance, special operations units, crime scenes, major incident photography, and search and rescue efforts. A 2017 Homeland Security Grant awarded $57,044 to buy a replacement engine for that plane. The Sheriff Dept. budget has found an additional $6000 to add to the tab. What does the Sheriff Dept. use this plane for and how it often that would require new engine after just three years? #28 Expand mental health services to youth and young adults…adding a full-time Senior Mental Health Client Specialist under a 3-year grant. Having just attended a memorial service for a 15-year-old’s suicide tragedy, I whole-heartedly support this use of taxpayer money, but feel that peer counseling could be increased for perhaps better effectiveness. #39 Report by Planning Department staff about how the Management Review Group is coming along with improving the permit process. I think the County needs to add in water agencies to the plan check list to really address the groundwater overdraft problem here. It would also be great if the Department of Public Works had a requirement that construction projects get an encroachment permit for work in the public roadways before any building permits are issued. Neither the Rancho del Mar Center nor the Aptos Village Project have an encroachment permit…so any property damage or injuries that occur at the roadway activity site are legally the responsibility of the taxpayers. Not good. #38 Awarding $66,272.50 to Baker Crew Consulting to include Cannabis License Tracking to make improvements to the Planning Department’s permitting process. The Cannabis Licensing has brought in about $2 Million, according to CAO Carlos Palacios’ report in agenda item #49, I suppose that is why the County has recently decided to abandon the Environmental Impact Report and its implementation of the 31 pages of mitigations. #42 Approving an additional $50,000 to Kittleson Environmental Consulting for storm damage repair site environmental monitoring. Mr. Gary Kittleson, sole owner, was awarded the contract for $50,000 on an emergency contract basis in June, 2017, and now claims, without any documentation, that he needs an additional $50,000. His wife, Kristen Kittleson, manages the environmental restoration efforts for the County Environmental Health `Dept. This seems like a conflict of interest to me. What do you think? #43 Awards $55,000 to Bowman and Williams for a storm repair design at milepost 1.93 on Cox Road, Aptos. I wonder why this special contract is getting awarded when there are already five other engineering firms (not Bowman & Williams) contracted by the County Dept. of Public Works to do this very work at a cost of $15 – $25 Million? Maybe it has to do with who lives on Cox Road? Did you know that the Director of Public Works, Mr. John Presleigh, plans to retire this April? That’s what Mr. Hagen, one of the Santa Cruz Metro Board members told me last week after I testified before that Board about concerns I have for elderly and disabled trying to use the future #71 bus stop relocated within the Aptos Village. He said he has visited the bus stop and sees no problem with the 100′ span of 5% grade sidewalk without resting platforms, lack of handrails, lack of seating or cover at the stop, or any other aspect. I suppose the fact that he has a nice eclectically-propelled wheelchair helps, but I have helped plenty of people who struggle to push themselves backwards up a sidewalk ramp to know that often those who are in self-propelled wheelchairs do not have the physical strength and endurance to get around some obstacles. I suppose the Board did not appreciate me reading to them the Ralph M. Brown Act section that clearly dictates that government officials should respond to public comment on un-agendized items by either briefly discussing the matter, referring the person to appropriate staff for information, or placing the matter on a future agenda for public discussion. I suppose a snide response qualifies as discussion…but there certainly were not any “thank you’s” by Board members to ANY of the members of the public who took time to attend last Friday’s 9am meeting in Watsonville. 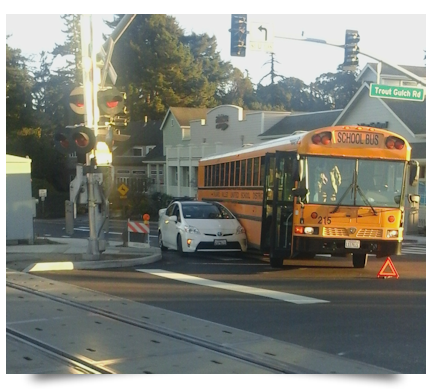 Not even to the school bus driver who was involved in the accident at the new taxpayer-funded Aptos Village Trout Gulch intersection near the new bus stop when a Prius driver tried to pass her bus on the right. Maybe the Santa Cruz Regional Transportation Commission (RTC) would like to hear from you about this intersection at their Board meeting Thursday, March 1, 9am in the County Board of Supervisor Chambers (701 Ocean Street, 5th floor). The Commission will be reviewing proposals for the state grants this year…I wonder how much the Aptos Village will get awarded? On the right is a photo of that dangerous intersection that will only get more hazardous when the new bus stop (just behind the school bus) gets activated. A recent article in Scientific American tells us that my mother’s advice to “feed a cold, starve a fever” may have been an error. Maybe so! Nonetheless, I am sticking with my mother’s remedy, and I am comforted that Scientific American indicates that my mother wasn’t the first to come up with this guidance for the sick and suffering. Apparently, this saying has been “traced to a 1574 dictionary by John Withals.” In other words, this advice about colds and fevers goes way back, and I am always suspicious of “the latest.” Sometimes, the “latest” isn’t the best. Allegiance to my mother, while a factor, is not the only reason that I am suspicious of any effort to reverse polarity on the “starve a fever” advisory. My experience as an elected official in Santa Cruz County in the 1970s and 1980s occurred at a time when the community was being consumed by the “fever” of runaway growth. Our little community (the smallest county in the state, geographically) was being overwhelmed by growth stemming from the fastest-growing economy in the state, located just over the hill. Santa Clara County used to be called the “Valley of Heart’s Delight,” and is now known as Silicon Valley, and while there were “gains” coming from this feverish transformation of Santa Clara County, a lot was lost when the “good old days” were left behind. In the 1970s and 1980s, the people of Santa Cruz County didn’t want our county to succumb to the ravenous fever of growth that was so completely transforming our Bay Area neighbor. 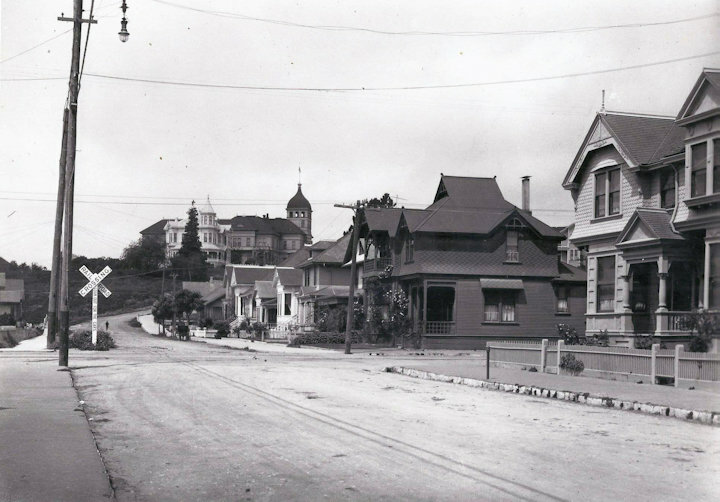 Today, things are not so different, though those who argue that Santa Cruz County should accommodate the growth of the Silicon Valley, and “feed that fever,” are not so much assaulting our farmlands and mountains, but are looking, instead, to transform our historic and much-loved neighborhoods into high-rise, apartment house canyons. We can, of course, feed the fire, and if we do, much of what we treasure most will be consumed. Given that the raging fever of high-tech growth could make us sick, I’m sticking with my mother. 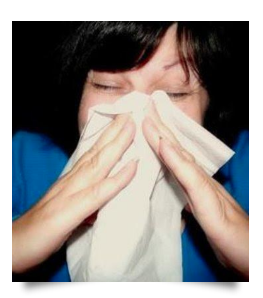 Starve a fever! That was her advice. We did it once before, and we can do it again. I think that’s the right remedy for the place I live. CLASSICAL DeCINZO. DeCinzo exposes Santa Cruz’s budget problem solution…see below. EAGAN’S DEEP COVER. 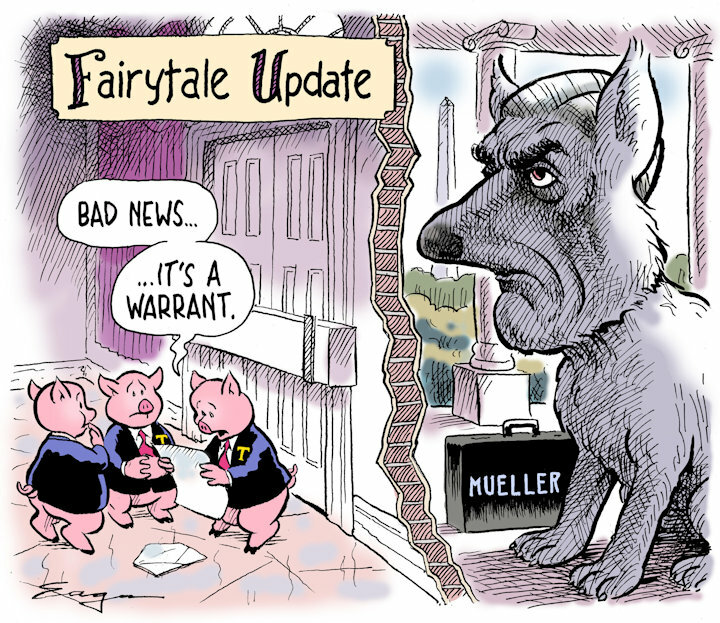 See Eagan’s ” Fairytale Update” down a few pages. As always, at TimEagan.com you will find his most recent Deep Cover, the latest installment from the archives of Subconscious Comics, and the ever entertaining Eaganblog. LISA JENSEN LINKS. Lisa writes: “The Oscars are coming! Compare your notes with mine as I try to guess who’ll go home with the gold this week at Lisa Jensen Online Express (http://ljo-express.blogspot.com/). Of course, along with the Oscars comes this year’s edition of the (dreaded) Oscar Barbies! But if it’s all too much, and you’d rather curl up with a good book, I have a recommendation for that too!” Lisa has been writing film reviews and columns for Good Times since 1975. ANNIHILATION. This is the Natalie Portman science fiction thriller that got 87 on RT. If you pay close attention, there is quite a moral, philosophic base to the plot, including one line I can’t forget… “all humans self-destruct either by suicide, drinking or smoking”. The same director was responsible for “ExMachina” so you can tell he’s got something to say — but it’s way too hard to follow. There’s a sort of foggy, swirly, shimmer-wall. People go through it. The dead come back to life, time goes back on itself, and on and on. Maybe if you really concentrate and stay awake you’ll get some kind of profound meaning from Annihilation…I’m not sure. GAME NIGHT. An extra-dopey, low grade, overused plot with stars like Jason Bateman and Rachel McAdams (and her dimples) trying to make it into a comedy. Couples get together for one of those “who did the murder” theme nights, only — ha, ha, ha — it isn’t a fake. Imstead it’s boring, trite, unbelievable, and lacks any semblance of humor. THE PHANTOM THREAD. It’s back again for a few days and at The Nick. Paul Thomas Anderson the director first made Boogie Nights, he topped that one with Magnolia, There will be Blood, and Inherent Vice and now there’s Phantom Thread. The star is Daniel Day-Lewis and seeing him and Anderson work together in this one makes it not a film but an experience. Day-Lewis in A Room With A View, My Left Foot, The Unbearable Lightness of Being became greater and greater with each role. Now he has promised to never make another film. If that’s true Phantom Thread is a brilliant masterpiece to end a career. It’s the story of a driven, crazed artist who designs women’s clothes…that’s all you need to know. As critics are saying it’s not a film for mass audiences, just those folks who appreciate genius. FILM STARS DON’T DIE IN LIVERPOOL. Gloria Grahame was an Academy Award winning sultry, smart “actress” (old term) in the 40’s and 50’s. In her later years she did some stage work in Liverpool and had a very serious affair with a much younger man. He wrote a book about it and this is the movie from that book. And it is an entirely captivating movie. THE INSULT. This is one of five foreign language films up for an Oscar on March 4. It’s a difficult political-religious film to understand and having white subtitles on white backgrounds doesn’t help much. It takes place in Beirut and it’s a courtroom drama dealing with Christians vs. Muslims. The actions and accusations by political and religious factions are hard to follow. Absolutely perfect acting, much tension…and unless you know the history of Palestine and Lebanon you’ll miss some important points. BLACK PANTHER. Like Gal Gadot’s Wonder Woman created a lot of good will and empowered women Black Panther does the same for Blacks in America and around the rest of the world. Both are Marvel Comics creations and are full of violence, killings and special effects. I’m finding it more and more difficult to see these action films with messages like revenge, torture, and blood and guts as having any semblance of cinematic art. Black Panther is science fiction, space travel and still the characters use spears to kill each other. There are messages in this movie so I read…but I sensed nothing positive in it. Now I wonder since this has been such a blockbuster if we’ll see Mexican Panther, Chinese Panther, Croatian Panther ? WINCHESTER. To see Helen Mirren in a miserable movie like this flop is just embarrassing. You know where 98% of it was filmed right? Yes, on sound lots in Australia…NOT the famous Winchester Mansion just over the hill. It’s dull, boring, darkly lit, and for a scary movie it misses at every bump in the night. Even Helen Mirren does a shameful job of acting…it’s her worst ever!! Shazia Mirza is a female muslim standup comic. I think she’s great. “POOR MARCH is the HOMELIEST month of the year. Most of it is MUD, Every Imaginable Form of MUD, and what isn’t MUD in March is ugly late-season SNOW falling onto the ground in filthy muddy heaps that look like PILES of DIRTY LAUNDRY.” Vivian Swift, When Wanderers Cease to Roam.